Robina is one of Australia’s largest planned communities, founded in 1980 alongside the Gold Coast, famous for its beaches, canals, waterways and subtropical forest hinterland. Serving the 25,000 residents, Robina Town Centre was originally constructed as an outdoor grouping of urban blocks containing shops and restaurants facing the lake, but this scheme was lost over the years. The expansion of Robina seeks to turn it from an inward-looking shopping centre into an open and urban town centre. The creation of a new market aims to work with local artisans to shape a new destination that combines fresh food shopping, cooking, tasting, learning and eating. The new spaces are unified by an un-dulating timber-clad roof creating shaded apertures. A series of south-facing notches brings daylight inside with minimal solar gain. Standing seam zinc is used as an external skin. Inside, the volume evokes a reversed nave, an impression reinforced by the regular ribs and strips of honey-coloured timber. The new market hall sits between two large supermarkets and consists of 55 new traders include butchers, fishmongers, restaurants and a micro brewery, all of which are dedicated to celebrating local/ regional produce, supplying the very best local products available. 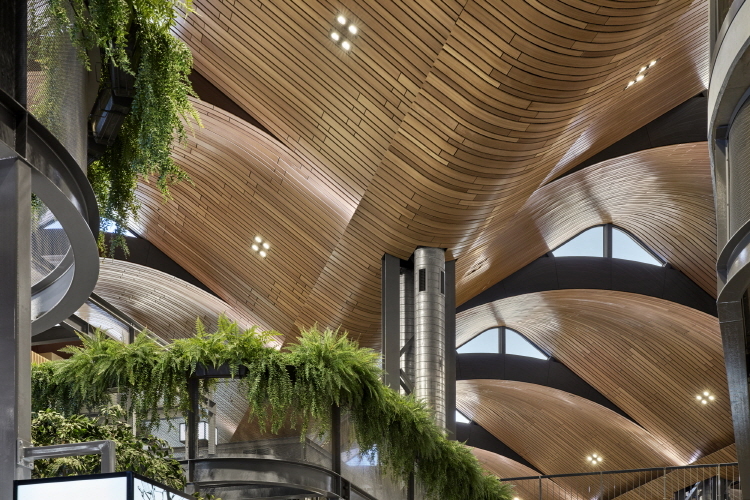 The market hall spills out onto a flowing, stepped landscaped area accessible from a new car-park, providing a water feature and lush planting. The new car-park façade is composed of laser-cut and folded metal panels, revealing swathes of colours and creating vivid variations in transparency and opacity as one moves along it.